Designed especially for the Aimpoint sights. 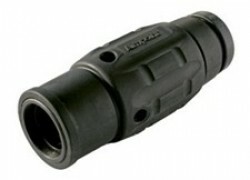 Can be used as a handheld monocular or weapons mount. When used with the Twist Mount ( sold separately) this devise can be quickly and easily installed and removed. No need to re-zero and does not affect the point of impact.